College. . . Not Just Where? . . . But Why? . . . If someone had asked me that question back in 1974 when I was graduating from high school and preparing to head off to Geneva College for the next four years of my life, I’m not sure I could have verbalized any kind of thoughtful answer. I might have mumbled something like, “Well. . . umm. . . that’s what high school graduates do.” I just assumed that college was the next normal stepping stone to adult life. The only choice I made was which college to attend. While my college experience was incredibly positive and life-shaping, I still wish there had been someone in my life who was challenging me to think about this and other crucial questions during my last couple years of high school. In today’s world, it’s a necessity. Extended adolescence, crippling debt, vocational confusion, and a host of other forces are combining in ways that make it necessary for us to pause and prayerfully think with our kids about the timing and direction of the steps they will take post-high school. If you’re a regular listener to our daily on-the-air and on-the-Internet audio spot on youth culture – “Youth Culture Today” – you know that today’s show on “College and Calling” broaches these issues. Take a minute and listen. We’ve been working to think deeply, strategically, practically, and biblically about these issues here at CPYU for several years through the work of Derek Melleby and our College Transition Initiative. Derek’s doing a fantastic job and is, I believe, one of best resources serving parents and youth workers on issues related to college. If you’re not already familiar with CPYU’s College Transition Initiative, take a few minutes to check it out. 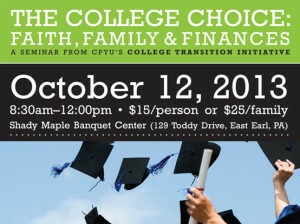 I’m excited to let you know that in just about a month (Saturday, October 12), Derek and The College Transition Initiative will be hosting a seminar for students, parents, educators, and youth workers who are looking for resources for making better decisions about life after high school. 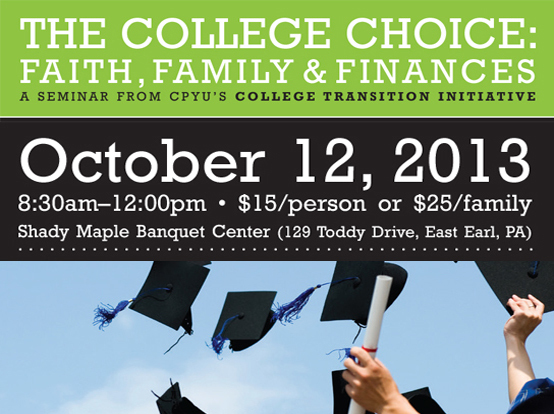 The seminar – “The College Choice: Faith, Family, and Finances” – will be held here in Central Pennsylvania. You can learn more and register here. 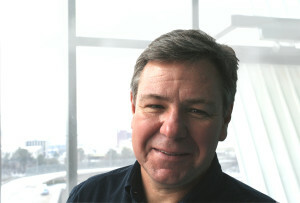 This week, I asked Derek a few questions about the seminar. . . . The mission of CPYU’s College Transition Initiative is to provide resources to help students (and parents) be more spirituallyprepared for life after high school. Since 2005 I’ve been giving seminars for students and parents that address issues of faith, spiritual formation and how to make the most of college from a Christian perspective. Since the economic downturn of 2008, I’ve noticed a trend during the Q&A: parents are really questioning the cost and value of higher education; students seemed to be more and more unsure about what they want to do after high school; and so many students are graduating with excessive, crippling debt. New books are being published every month that call into question the worth of a college degree. I should say upfront that I am not naïve enough to think that this seminar can prepare families completely for the college planning and admissions process. But from the beginning of CTI, my main focus and passion has been creating opportunities for parents and students to have more meaningful conversations about life after high school. We live busy lives. We need to be intentional about creating space to ask good questions, listen to each other and think through the best “next steps” in the process. My hope and prayer is that people who attend the seminar will (1) learn to ask the right questions about the college planning process, questions they might easily miss and (2) be pointed in the direction of helpful resources that can guide them along the way. Anyone who is thinking about or already planning for college. It really doesn’t matter if you are early in the process (family with a 9th grader) or later in the process (family of a senior in high school). It’s never too early or too late to start thinking wisely about life after high school. Also, all of the advertising for the seminar says that “seating is limited.” This is not a marketing technique! We actually do have a limited space. If you are interested in attending, please do not hesitate to register. ← Johnny Cash. . . Ten Years Ago Today. . . .